At the end of our post "Using Photoshop Generator for Mockups" we mentioned Flinto as another point of interest concerning automated image asset generation. Since then, Flinto introduced syncing screens with Dropbox. This featured dovetailed nicely with our previously outlined workflow, and we wanted to share the improvements. Previously, we were focused on using Generator to ensure our Photoshop and InDesign documents were congruent. 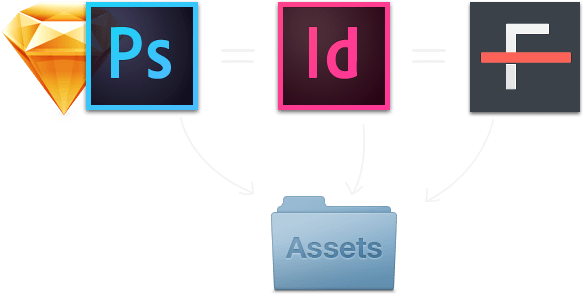 Now, with Flinto’s recent updates, Generator outputs screen designs that can be used by both InDesign and Flinto simultaneously. This means Photoshop is your single point of attention, while two other apps automatically update to reflect the changes. Over time Flinto has become an integral part of our workflow. It started out as a useful internal tool but has since grown into a valuable means of communicating our ideas to our customers in an intuitive, hands-on way. If you haven’t already tried Flinto yet, head over to www.flinto.com and give it a look.